I started out carving strum hollows by hand. After carving many strum hollows I thought I’d try using power tools to save some time. The power tools did save me a little time but the cost was a lack of feeling more connected to the work. I simply prefer the quiet, hands-on time of using hand tools at the bench. 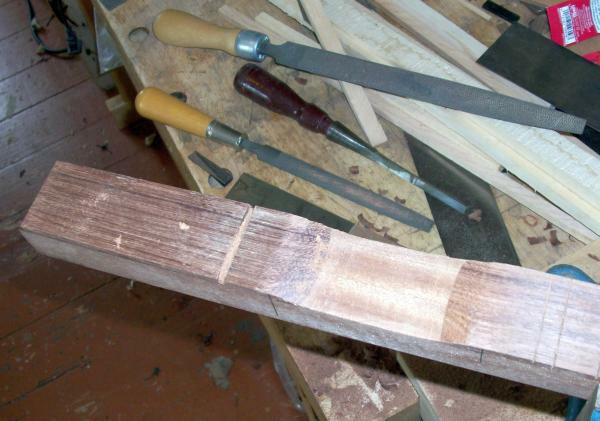 I mark out the area for the strum hollow, rough it out with a chisel, shape it with a rasp and clean it up with a file and scraper. The one in the photograph is about half done. Makes a satisfying “whissssk” sound, but perhaps not accurate enough. The spance is a little tight for a standard spokeshave, maybe an old Millers Falls cigar shave would work…..Oh well, might have to get more tools!